Rohith Vemula, a young Dalit research scholar and student activist of the University of Hyderabad, would certainly not have wanted to die. No one with dreams does, after all. Yet, he died yesterday, on 17th January 2016. He killed himself after leaving the protest venue he was living at for 15 days, after getting expelled from his hostel. He sneaked out on some pretext and hanged himself. Did he really kill himself though? Go through the ‘suicide note’ and it becomes apparent that he did not. He was in fact killed by the phantom limb of caste on which the pretentious democratic credentials of the republic are superimposed. He was forced into killing himself for standing against and injustices against his people, the ex-untouchables. Rohith was forced to kill himself because he did not stop at that cardinal sin of fighting for his own people. He dared to speak for all the marginalized ones, be it the minorities, the workers or women as a leading activist of the Ambedkar Students Association (ASA). There is nothing new in suicides, actually cold blooded murders, of bright Dalit students in premier educational institutions of the country. Many such incidents have been documented in the recent past showing how continuous harassment from the so called upper caste faculties and students pushed Dalit students into taking the extreme step. A documentary named ‘Death of Merit’ had counted 18 such cases in 4 years up to 2011 and led to a fierce discussion on the issue. The outrage over the suicides led to the intervention of the National Commission of Scheduled Castes (NCSC) which made a three-member team of senior professors re-evaluate his answer sheet. The team found that he had in fact passed the examination. It was only after NCSC's intervention that the police filed the FIR under SC/ST (Prevention of Atrocities) Act. Not all the Dalit students killed by the system were fortunate enough to get even this much; a semblance of justice of something being done against their murderers. Despite the clear pattern of caste based discriminations leading to such ‘suicides’, there is something markedly different in Rohith’s case. He, unlike most of the other young Dalits murdered for their caste, was not killed behind the walls of educational institutions away from the public gaze. His case was not about bad grades, or getting deliberately failed by the rogue faculties. Neither was his case about years and years of such endless torture finally culminating in a suicide and the world getting to know of that only after the final act. Rohith’s suicide-murder was not one of them. It unfolded under full public gaze, on television, in social media, a gaze that apparently failed to save him. Further, most of the other victims of suicide-murders had no support system inside the institutions they were harassed in, Rohith had. He had his friends, colleagues and common students supporting him in droves. He was expelled from the hostel and hundreds of those not expelled came to sleep out in open with him in solidarity. He, with his activist friends, led a procession in his campus and thousands marched in their own across the country. Yet, he was forced to kill himself and that is what makes this suicide-murder different, and a dangerous marker of the times to come by. Recapping the incidents that led to Rohith’s suicide-murder may shed some light on the times to come by for the marginalised of the republic. His troubles started when ASA organised a protest march in August 2015 at the campus against the attack on the Montage Film Society in Delhi University by Akhil Bhartiya Vidyarthi Parishad (ABVP). They were attacked for screening a documentary movie ‘Muzaffarnagar Baaqi Hai” that exposed the roles of Hindutva outfits in Muzaffarnagar riots in 2013. Local ABVP unit did not, of course, like the protests and its leader Susheel Kumar posted a comment on Facebook calling ASA members ‘goons’. He later submitted a written apology. Next morning, Susheel Kumar alleged that about 30 students belonging to the ASA had beaten him up and he had to be hospitalized. Based on these findings, the Board, reportedly, decided to end the matter with a warning to both the groups. The final report of the Board, however, inexplicably blamed ASA activists for causing injuries to Susheel Kumar and ordered the suspension of five students, including Rohith. ASA organized a protest following the suspension and held an open discussion with the then vice chancellor Prof. RP Sharma over the discrepancies in the findings and the punishment. Realising the injustice done to ASA students, Prof. Sharma revoked the suspension, subject to constitution of a new committee to enquire into the incident afresh. Things started changing course soon afterwards. The new vice-chancellor Prof. P Apparao who took over from Prof. Sharma constituted no committee for a fresh enquiry and kept the suspended students in the dark until the Executive Council decided to suspend the students and expel them from their hostels. Self-evidently, Union Minister Bandaru Datttreya’s ‘intervention’ with the Ministry of Human Resources Development (MHRD) seems to have played an important role in the change in the university administration’s instance. Mr. Datttreya, as it later came to be known, had intervened with the MHRD and urged it to discipline “casteist, extremist and anti-national’ elements like ASA. His primary reason for accusing ASA to be all this was simple- it had “held protests against the execution” (of Yakub Memon). Yes, he chose a reason which would turn many of the celebrated lawyers of the country including Anand Grover, Prashant Bhushan, Indira Jaisingh, Yug Choudhary, Nitya Ramakrishnan, Vrinda Grover and others into anti-nationals for opposing the same and seeking (and getting) an unprecedented 5 AM hearing by a Supreme Court bench to stop the execution. What could have made a Union Minister intervene with the MHRD in such a ‘small’ case, likes of which keep taking in campuses across the country? 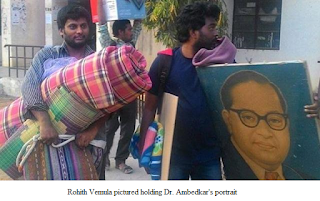 Was it Rohith’s, and ASA’s, attempt to link the struggles of all the marginalized communities into one that had irked him? Perhaps it was, as Dalits standing up for Muslims, a vulnerable minority, would puncture the politico-ideological narrative that has propelled the present regime to power. This makes the suicide-murder of Rohith markedly different from those preceding it and must send a shiver down the spine of any conscientious citizen of the country. The operational blame of past suicide-murders of the Dalit students lied, primarily, with identifiable rogue casteist elements; rogue because practicing casteism was never that easy despite it being deeply entrenched in the system. Harassment of Dalit students in prior cases could often be traced back to the individual perpetrators. It never was brazen enough to allow an incumbent union minister proactively trying to silence the voices for social justice by terming them anti-national and what not for raising issues as a united whole and not from the scattered locations of being a Dalit, a minority, tribal and so on. This is also why Rohith’s suicide cannot be seen as an act of desperation. Neither was his struggle an individual one, for grades for instance, nor there was a reason for him to go desperate suddenly. His suicide note makes it clear too. His letter is not a suicide note in fact, it is an indictment of the republic that had been failing its vulnerable citizens for long and has started to shed even the pretence of justice of late. It is this reduction of human beings into mere categories that he fought against all his life. It is this reductionism, perhaps, he tried to challenge with one last act of supreme sacrifice. His body, as a body of a Dalit, had always been a site of struggle between forces wanting to dehumanize and own it and those wanting to put an end to this dehumanization. He turned it into a site of marking the necessity of all liberation struggles joining hands against increasingly vitiating attacks of the old order with new power. This is our turn to not let his sacrifice go in vain. This is our turn to ensure that a functioning and accessible mechanism is put in place to support those fighting against systemic discrimination based on caste, gender, religion or any such regressive identity. It is high time to ensure that perpetrators do not get away with their crimes- be it witch hunt of activists or torture of individual students. We need to begin with ensuring that all those responsible for this suicide murder, including VC Appa Rao and Union Minister Bandaru Datttreya, are booked under both -the provisions of the Scheduled Caste and Scheduled Tribes (Preventions of Atrocities) Act and for abetment of suicide-murder of Rohith Vemula.